Image via the official Star Wars May the 4th Website. May the 4th be with you! Today, Star Wars geeks everywhere will be cracking bad jokes and waxing nostalgic about how much better the original trilogy was than the prequels. And on this special day I would like to remind everyone that Han shot first. 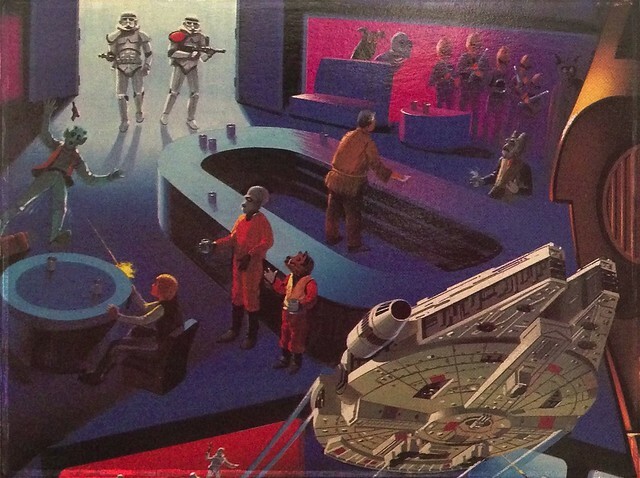 Fortunately, my point is reinforced on the box art for the Micro Machine Star Wars Cantina playset which I stumbled across in my parents’ attic. Notice, a single shot fired by Solo—not a defensive or counter shot following an exchange from the green-skinned bounty hunter. We all know that toys are incapable of lying, so, there’s your proof. Do you think it matters that/if Han shot first or in self defense? Why or why not? Sound off in the comments below. This entry was posted in Movies, Toys and tagged Entertainment, Han shot first, Han Solo, movies, postaweek2013, Star Wars, Star Wars Day, starwars, toys on May 4, 2013 by Ammon. 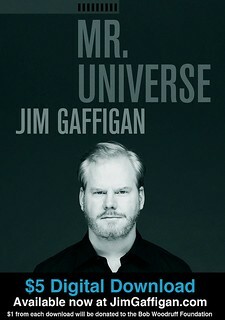 Sorry Spider-Man and Batman Begins; I’ve got a new favorite superhero movie. Today I saw the Avengers. Again. And guess what? It’s … still … awesome! This time I took Bongo & Lulabelle and they loved it, too. 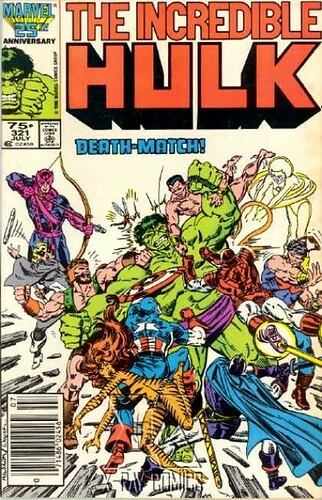 I’ve never been a huge fan of the Avengers. 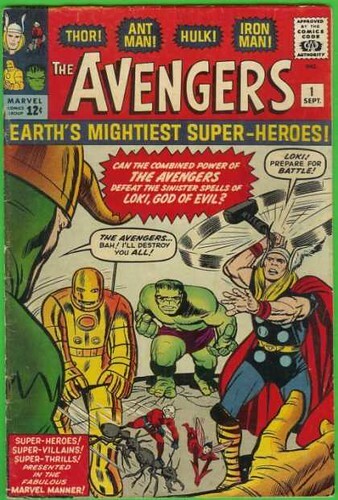 To me the team was always just the big three—Captain America, Iron Man, and Thor (none of whom were particular favorites of mine, but whose recent movies were all very, very good)—and a rotating cast of B-list superheroes who couldn’t hold their own titles. Why do I like the movie so much more than I ever did the comics? 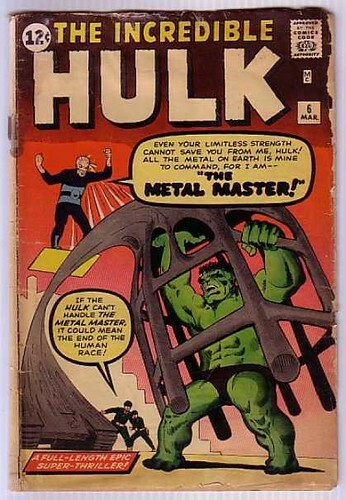 There’s one major reason and he’s the “ enormous green rage monster” who stole every scene he appears in. The physical humor that played through in his fight with Loki and later in his sucker punch to teammate Thor were priceless! I can’t remember laughing so hard during an action movie ever. Nothing against Eric Bana or Edward Norton, they’re both fine actors in their own right, but Mark Ruffalo played a better Bruce Banner than either of them ever were. I believed that he was equal parts genius and monster. Have you seen the Avengers, yet? 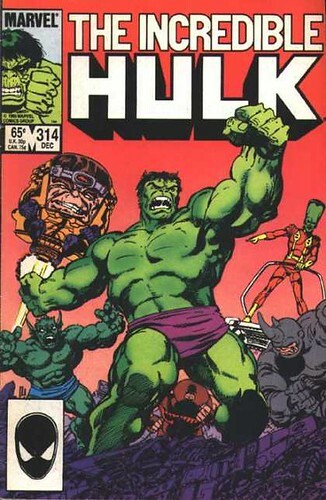 What did What did you think about Marvel’s not-so jolly, green giant? Sound off in the comments below. All images via Cover Browser unless otherwise noted. 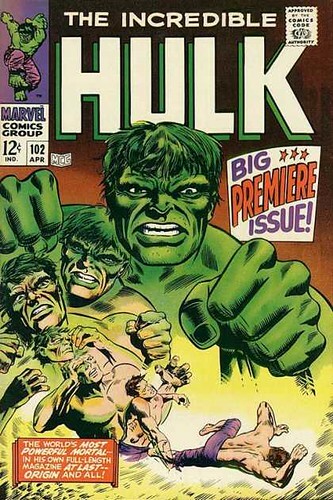 This entry was posted in Comics, Movies and tagged avengers, comicbooks, comics, Entertainment, geek, hulk, marvel, movies, postaweek2012, superheroes on May 12, 2012 by Ammon. 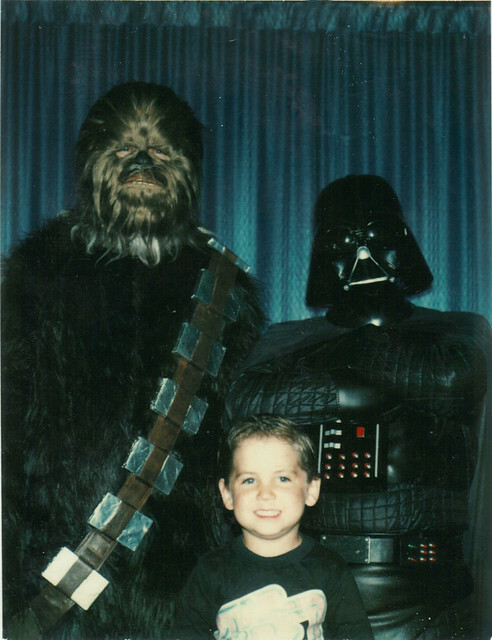 Did I ever tell you about the time I met Darth Vader and Chewbacca? I didn’t!?! Well, it was only the best day of my life! Yup, that’s little me with them in the picture above. Just chillin’ with Vader and Chewie, no biggie. In reality, I have absolutely no memory of this day and if it weren’t for this one polaroid, I never would have remembered that this meeting even took place. From the look of the smile on the face of my 4 year old self I’m pretty sure that this was the highlight of my life up to that point. What I do remember is that I, like many children of the 70s, loved Star Wars with a passion. I watched the movies, I re-enacted my favorite scenes with the toys, I read the comics, I listened to the records, I the wore t-shirts & pajamas, and slept under the sheets. Such an encounter couldn’t have been anything less than magical. What’s the best thing that’s ever happened to you that you can’t remember? Sound off in the comments below. This entry was posted in Life, the Universe, and Everything, Me, Movies and tagged Chewbacca, Darth Vader, movies, nostalgia, postaweek2012, retro, Star Wars, starwars on January 30, 2012 by Ammon. When I was a kid, something magical happened each Friday night. The whole family gathered around the TV to watch The Muppets until we laughed ourselves silly. No skit has had more enduring appeal to me than a very special, Star Wars themed Pigs in Space. Luke Skywalker, Artoo, Threepio, Miss Piggy, Gonzo, & more stared in spectacularly unforgettable sketch. To my young, impressionable mind this was coolest thing that had ever happened in the history of the universe. 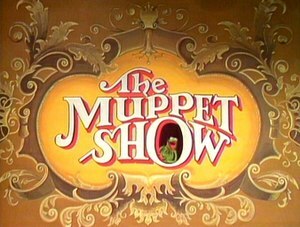 What was your favorite Muppet moment? Sound off in the comments below. This entry was posted in Movies, Television, Videos and tagged Entertainment, humor, movies, muppets, nostalgia, postaweek2012, retro, Star Wars, starwars, television, tv on January 11, 2012 by Ammon. 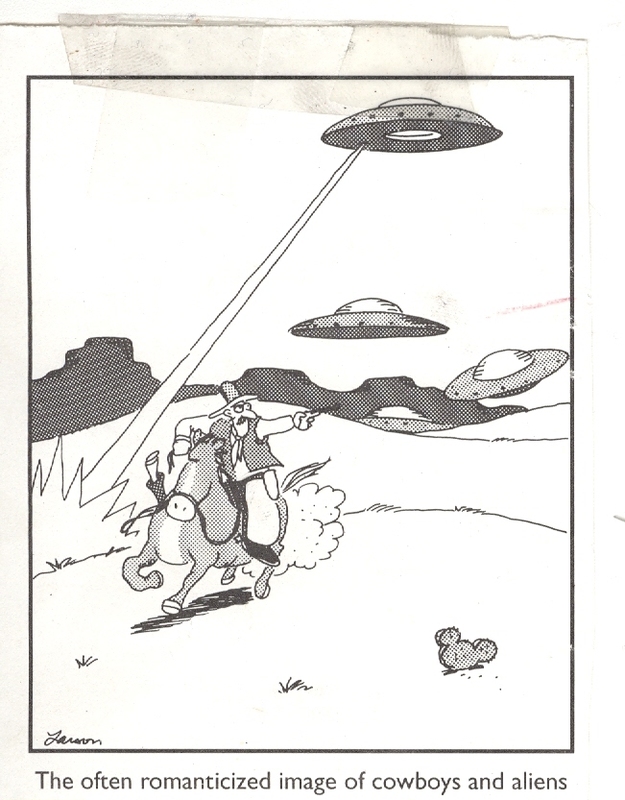 Gary Larson provided the original concept and Clarissa explained it all, but did you know that Nick Jr.’s plucky, young anthropomorphic quintet may have also inspired the Cowboys and Aliens movie***? 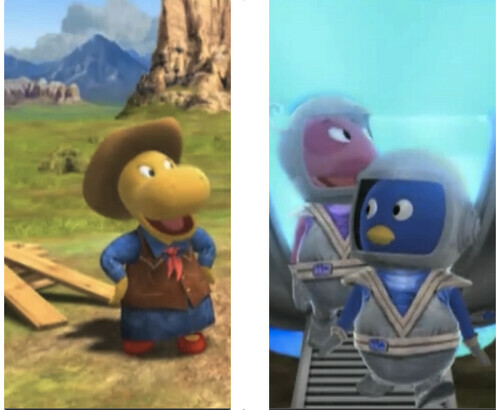 Way back in The Backyardigans episode Ranch Hands From Outer Space (Season 3, Episode 14 for anyone who cares) a cowgirl hippo meets up with an alien penguin and pink bug-thing. Sadly, there is no shooting of UFOs in this episode. After a series of comedic mishaps the Cowboy (yellow hippo) and Aliens (blue penguin and pink bug-thing) sing, dance, and have a snack. If, like me, you have kids between the ages of 1 and 8 (or if you’re really weird) you may have seen this episode before. If not, don’t worry. Nick Jr. has the annoying habit of playing the same episode of a show every day for weeks on end—it’ll turn up eventually. For the impatient types, go to Netflix and you can even stream it on demand. Have you noticed the recent trend of ripping off resurrecting old ideas for TV shows and movies? Which ones in particular have caught your attention? Sound off in the comments below. ***Props to Lynette for bringing this one to my attention! 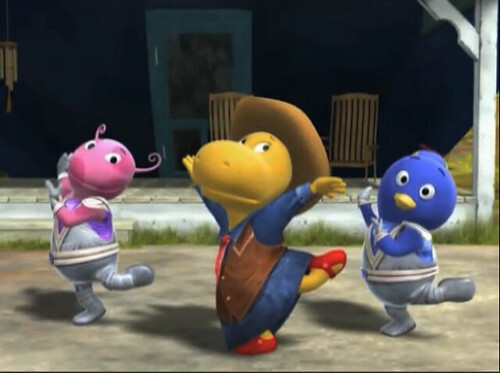 This entry was posted in Movies, Television and tagged Backyardigans, Cowboy, Gary Larson, kids, movies, Netflix, Nick Jr, Nickelodeon, postaweek2011, television, tv on August 13, 2011 by Ammon. Superhero movie season is upon us once again. Thor, X-Men First Class, Captain America, and Green Lantern (sadly no Wonder Twins movie though) will all grace the big screen this summer. My wife is a trooper and I’ve already been able to talk her into seeing one of these with me, but I want to see them all! How can I get her to go with me? Bongo: How about this one? Lulabelle: No, I don’t want to see it. Bongo: You’ll like it. It has romance! Lulabelle: I am not watching Spider-Man! OK, so maybe it didn’t work out quite the way that he had hoped, but guess what? 90% of the time it does. Plus, you’ve got to give the kid credit for playing the romance card—did I mention he’s only five?!? He’s smooth that one, real smooth. It turns out that most superhero shows are so good these days that all you don’t need to resort to trickery to get non-fans to watch them with you. Because Bongo asks her, he has gotten Lulabelle to watch everything from Justice League Unlimited and Batman Beyond to Iron Man and yes, even Spider-Man with him! 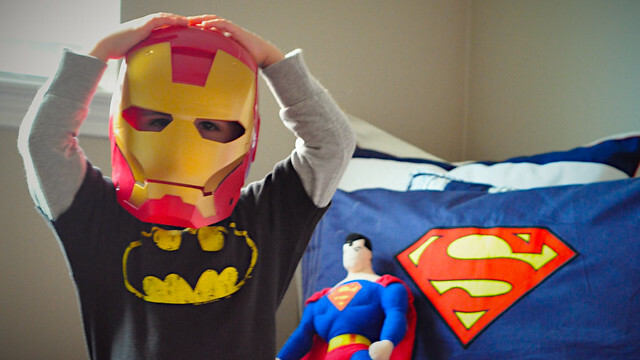 What tactics will you use to get your gal (or dude) to watch this years superhero flicks? Got anything better than flat out asking? Sound off in the comments below. This post was featured on the 9rules Noteworthy Content of the Week blog on June 8, 2011! This entry was posted in Comics, Family, Life, the Universe, and Everything, Movies and tagged Batman Beyond, Captain America, Entertainment, green lantern, how to, Justice League Unlimited, kids, movies, postaweek2011, Spider-Man, superheroes, x-men first class on June 7, 2011 by Ammon.